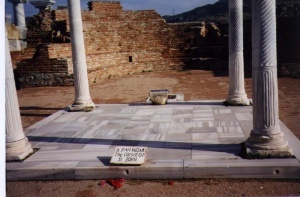 Ephesus was an important center for early Christianity. The city, in western Asia Minor, was a significant center along the missionary travels of Apostle Paul during the first century. The Christians of Ephesus were recipients of one of Paul’s letter as well as one from St. Ignatius in the second century. Ephesus was one of the seven cities mentioned in Book of Revelation. It was the site of the Third Ecumenical Council in 431, and it was the see of St. Mark of Ephesus in the fifteenth century. Ephesus (Greek: Έφεσος, Turkish: Efes) was founded as an Ionian Greek city in the tenth century before Christ by colonists from Athens. Founded on the Cayster River where it flowed into the Aegean Sea, Ephesus was a trading center during pre-Christian history with an extensive mythological history. It is the site of the pagan temple of Artemis, one of the ancient Seven Wonders of the World. Ephesus came under Roman rule in 86 BC and became the capital of proconsular Asia in 27 BC. Under Roman rule Ephesus prospered, became a metropolis and a major commercial center, second only in size to Rome. It was this city that Paul came to on his missionary journeys. While the destruction of Ephesus by the Goths in 263 reduced the splendor of the city, it continued to be an important city through the fifth and sixth centuries. It was again partially destroyed in an earthquake in 614. Over the years the commercial importance of Ephesus declined as the Cayster River silted up the harbor, causing the city to lose access to the Aegean Sea. Attacks by the Arabs in the following centuries furthered the decline of the city such that by the eleventh century it was reduced to a village. During the following centuries the town prospered for a short time under the Turks, but was finally abandoned during the fifteenth century. Today Ephesus consists of the remains of the temple of Artemis, the theater, stadium, and a "Double Church" that probably is an old cathedral that was dedicated to the Virgin Mary where the councils of 431 and 449 were held. Ephesus was an early center of Christianity. St. Paul spent three years in Ephesus establishing and organizing the church, before he was forced to leave the city. His letters included one addressed directly to the Ephesians. Traditionally, the Apostle John the Theologian spent the last days of his life in Ephesus where he was buried. Tradition also places the death of St. Mary Magdalene in Ephesus. During the early centuries of Christian era, Ephesus continued as a center of Christianity second only to Antioch in Asia Minor. The Council of Nicea conferred on Ephesus ecclesiastical jurisdiction over the diocese of Asia Minor that included eleven provinces. Ephesus was the site of the Third Ecumenical Council where Cyril of Alexandria led the condemnation of Nestorianism. Justinian the Great built a large church adjacent to Ephesus that was dedicated to John the Theologian. In the following years the city suffered from the deprecations of the Arabs and later the Turks, while during the iconoclastic period the defenders of images were martyred. After being destroyed by Turks in 1090, the community was rebuilt on the hills surrounding the church of St. John and was commonly called Hagios Theologos ("Holy Theologian"), referring to St. John the Theologian. After the succession of attacks during the fourteenth and fifteenth centuries the Christian community was greatly reduced such that when Mark of Ephesus attended the Council of Florence in 1439, he represented a community that had become a village. This page was last edited on March 2, 2010, at 23:25.